The Mako Shark 'dream car' was one of the most stunning conceits in automotive history. An exotic blend of supercar styling and supercharged grunt, it paved the way for one of the most spellbinding roadsters ever made. The Corvette Stingray took low-slung chic to another level. A production car had seldom - if ever - looked so good. A marine mammal provided design inspiration. William Mitchell - GM's chief stylist - went fishing, off Florida. His luck was in! After landing his catch, Mitchell was blown away by its beauty. He had caught a mako shark - a streamlined slab of predatory power. It was graced with blue and white hues, to die for! Immediately, his design sensibilities kicked in. He saw a way to bring to the roads what had previously been confined to the deep. In automotive terms, that short-fin shark was going to go global! In fact, the Stingray 'Spider' was the first of the breed. A racing test-bed, it was the high-revving base upon which the Mako Shark built. The Stingray would be the final piece in the jigsaw. 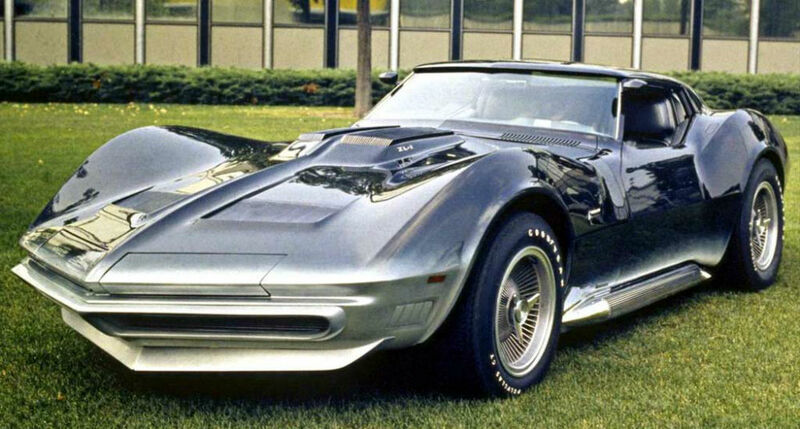 Of course, many of the Stingray's styling motifs can be seen in the Mako Shark 1. Indeed, they had the same designer - Larry Shinoda. But, even the Stingray had its work cut out to compete with its prototype predecessor. Its projectile-style bodywork, and gradational paint took pride of place - but they were only the beginning. Not just the exterior - but the interior, too - were a futurist time-warp of avant-garde art. It was the start of the Sixties, after all ... and so the perfect time to get radical with form and function. With plastic the new gold standard, the wraparound windscreen and see-through hardtop were 'classic' space-age styling touches. To top them off - literally - was a periscope rear-view mirror! Ranged along the Mako Shark's flanks were two banks of exhausts, catering to the V8 motor. And the 456bhp it output! One thing is for sure. When that mako shark mammal gave up its life - in the waters off Florida - an automotive legend was about to be born!